Over the past few weeks, viagra we have discussed on The Round Table the heartbreaking case of 13 year-old Jahi McMath, store the young girl who went into Children’s Hospital, sick Oakland, for a tonsillectomy and adenoidectomy. What ensued after that is about as painful a thing that could ever happen to parents. Having to hear medical personnel declare that your child is dead and that they were going to remove your child from the only thing that is keeping her body alive, a ventilator. No one knows what happened to Jahi. Until an autopsy is performed, we will never know. As a Registered Nurse, I know that once there is no brain activity at all, a person is legally dead, and a hospital does not have to seek permission from family members to remove the person from life support. Children’s Hospital was prepared to do just that. Jahi’s family went to court, because they feel that Jahi can recover. Hope is a very powerful thing. Faith is a very powerful thing. Acceptance is also a very powerful thing. The family of Jahi has hope. The family has faith. The family does not accept, however, that their loved one is no longer in the shell that we call a body here on earth. After numerous court procedures, Jahi’s mother was allowed to remove Jahi from Children’s Hospital, to an undisclosed location for further treatment. Realistically, there is no treatment that would ever bring someone who has no brain activity back, and eventually, what will happen is the ventilator will no longer sustain the body, and it will begin to break down. Some say this has begun to happen to Jahi already. As a mother, I understand the anguish and the pain of the family. As a healthcare provider, I know that what is happening shouldn’t be happening. It is time to let Jahi’s body go. Let her body rest in peace. It has been through so much already. I personally feel like as long as her family has hope that her body can recover then let them have that hope let them have that ventilator let them hold on to what they can until they are ready to accept that she is no longer with them. What happened to this child is very unfortunate with a very common procedure this should not have occurred in realistic terms but God has the final say so and even in this tragedy we can find triumph. Monica, I agree that what happened is a tragedy. Jahi’s body secretions are becoming malodorous, meaning she is rotting from the inside. She can’t regulate her own body temperature. She hasn’t had a bowel movement since early December. With no blood flow to her brain, it will begin to liquefy, if it hasn’t already. She deserves more dignity than that. Monica – your attitude is positive and laudable but misguided. False hope is worse than no hope. At least when hope is gone, faith can be retained, acceptance can begin, and the family can start to mourn and move on with life. With false hope, everything remains on hold. It’s unhealthy to say the least. I agree – as hard as it is to live without our kids it is time to let Jahi go, so that she can R.I.P. I am still in disbelief. 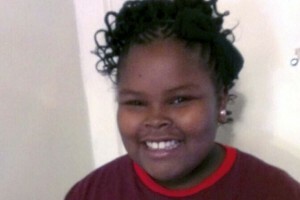 So sad and I pray that her family will let go, in order for Jahi to rest now. Letting go can be hard but not to the point where it becomes morbid and cost more to keep someone that is medically determined dead alive. Yes, it is a decision that is not easily made when there is still brain activity, I know, we where there with my mom before she passed onto glory, but after being on life support three weeks; the night she passed and they called us back the nurses were breaking down the machine and we knew she was gone, because her fine complexion had started turning purple. She had gone. Now the family needs to seek answer from the hospital that performed the procedures and seek out answers from the surgeon and the people that administered anesthesia; did she get enough oxygen? Surgery to remove ones adenoids is dangerous for adults and children, anytime they go through your sinus passages to get to a particular are that is dangerous. The same holds true for the surgery I just had orbital decompression, but glory to God they did not go through my sinus area, there was not a need. It sounds to me that they hit something going through her sinuses and only an autopsy will reveal the truth. If they want the truth they have to let them perform an autopsy and accept she is gone. An old saying that I heard before, that is doctors are your biggest murderers because all they do is sign the death certificate and hope no one ever questions their mistake. This seems to be a medical error and truthfully not an insurance issue, something did happen to cause here to start to bleed the way she did. Especially after being alert out of surgery, something did happen in the operating room and only God and that staff knows the truth. I pray her family heals now and keep Jahi in their heart, where she will always be with them. OMG! My heart aches for this family and mother. As a mom, I would never wanna give up hope or on the faith that God will do what needs to be done. As parents it’s never easy to see your child helpless, sick, hurt in any manner. But I do feel that it’s time to let this baby rest in peace. Mom, isn’t ready to let her baby go. What mother would?